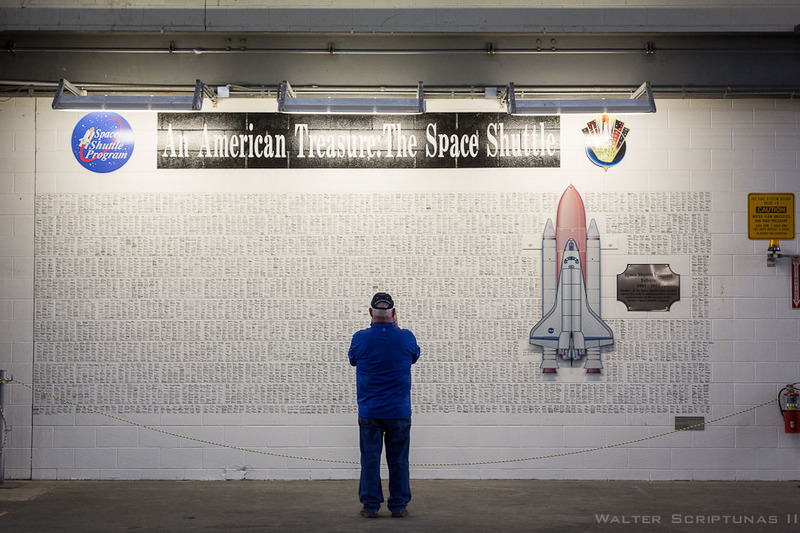 In the quiet, peaceful setting of a storage bay in the northwest corner of NASA's cavernous Vehicle Assembly Building at the Kennedy Space Center on Monday afternoon, a handful of photographers got the chance to walk underneath, around and above the orbiter Atlantis, the spaceship that flew the final space shuttle mission a year ago this month. 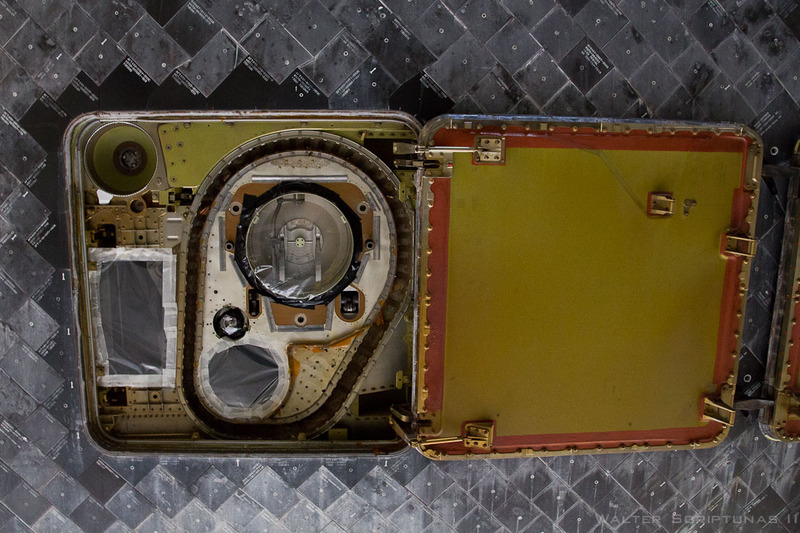 The tranquil opportunity allowed Spaceflight Now photographer Walter Scriptunas II to shoot this gallery that captures Atlantis in exquisite detail. 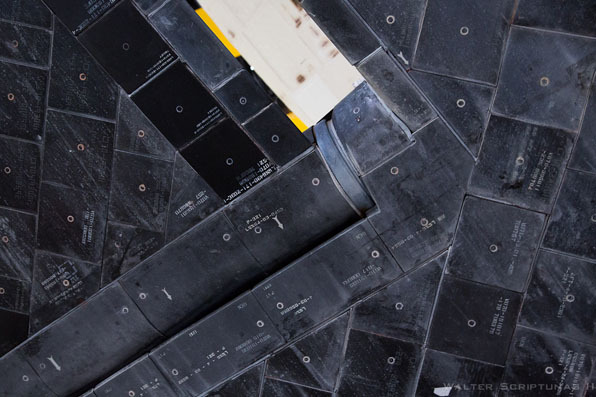 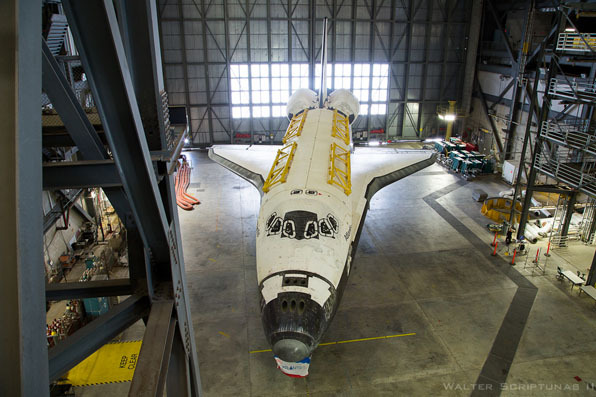 The spaceplane flew 33 missions in a quarter-century of spaceflight, accumulating 307 days in space, 4,848 orbits of Earth and 125,935,769 miles traveled. 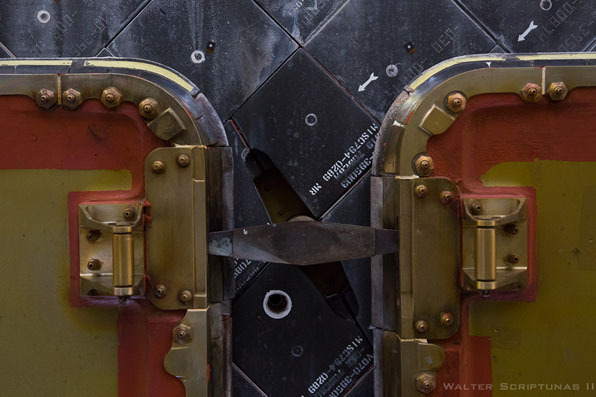 She deployed memorable planetary probes, the Magellan radar mapper to Venus and Galileo to tour Jupiter, the Compton Gamma Ray Observatory, plus numerous military and commercial satellites, conducted a majority of cooperative dockings to the Russian space station Mir, gave the Hubble Space Telescope its last tuneup and labored to construct the International Space Station by hauling multiple modules. 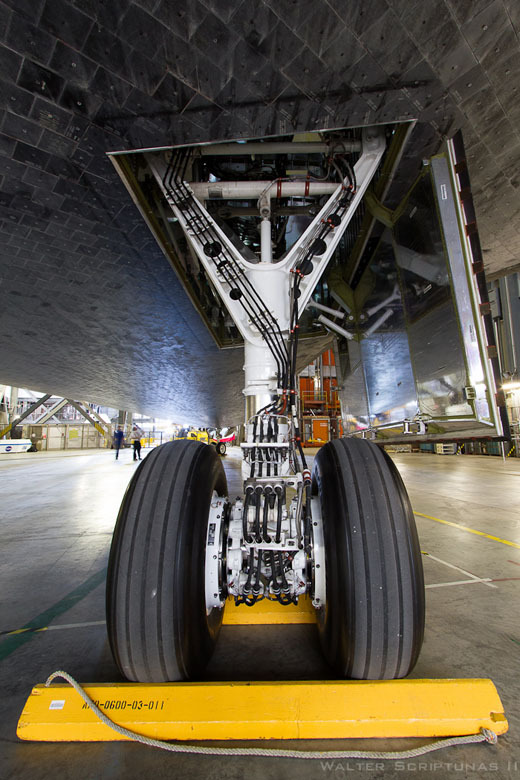 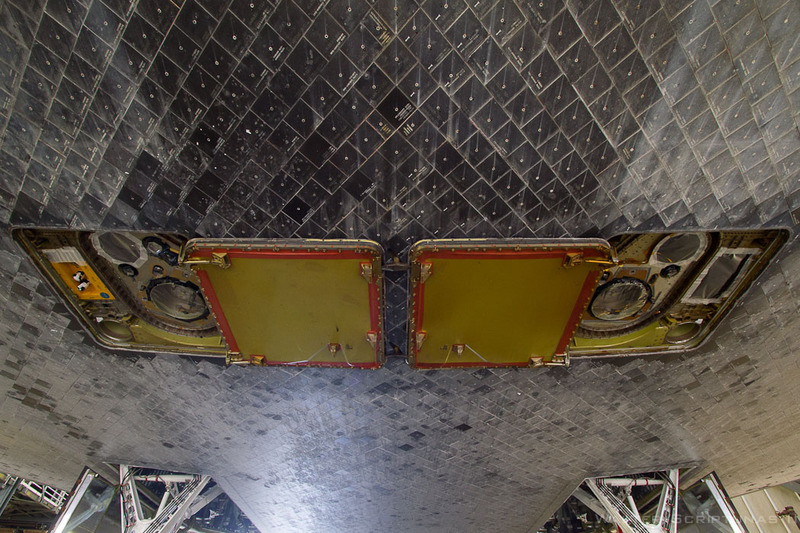 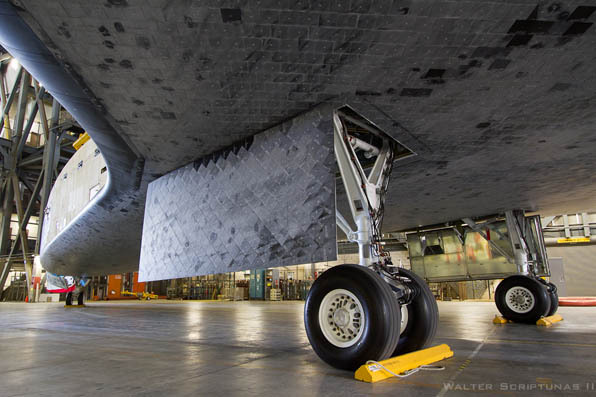 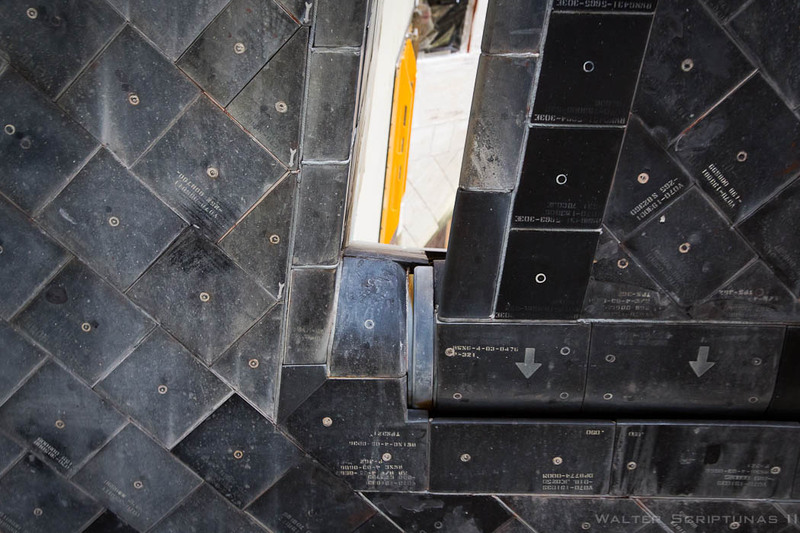 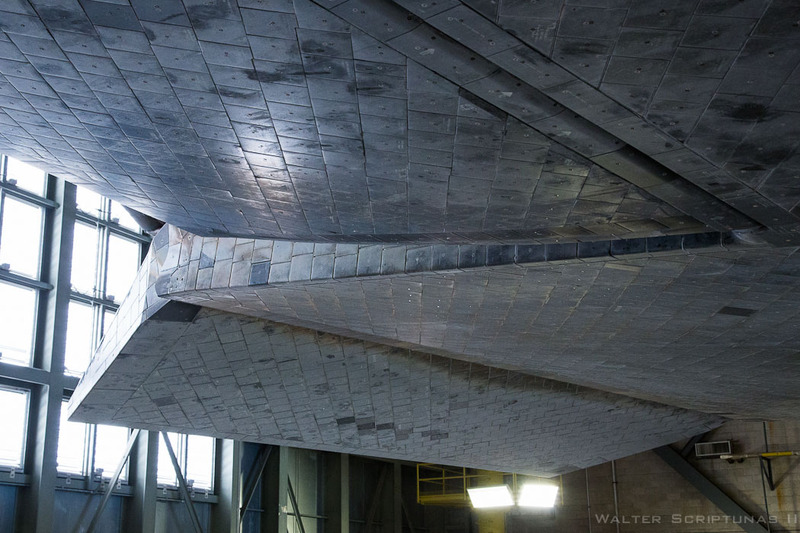 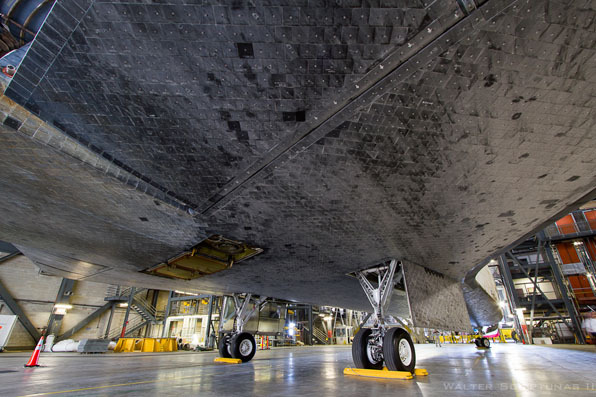 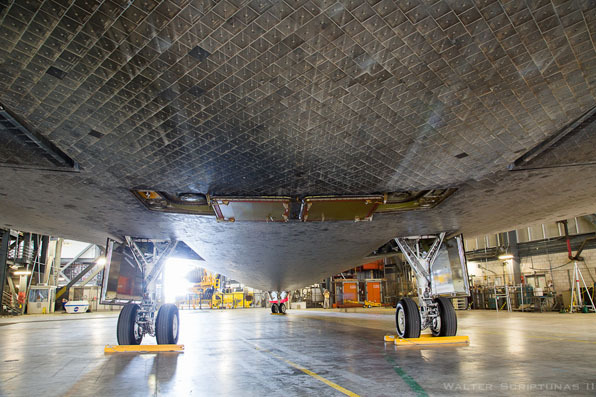 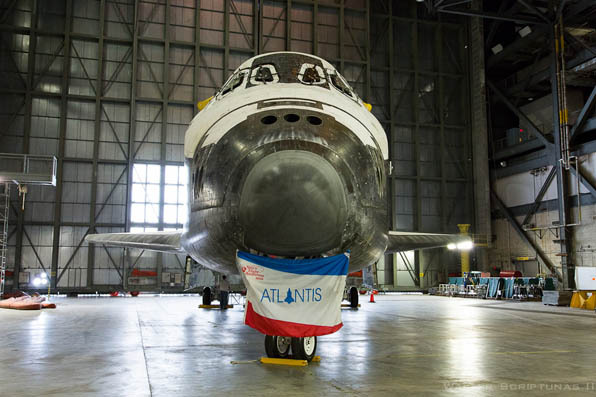 She then sailed into history with a final climb to orbit last July 8 and one final landing on July 21, bringing the wheels of the space shuttle program to a stop. 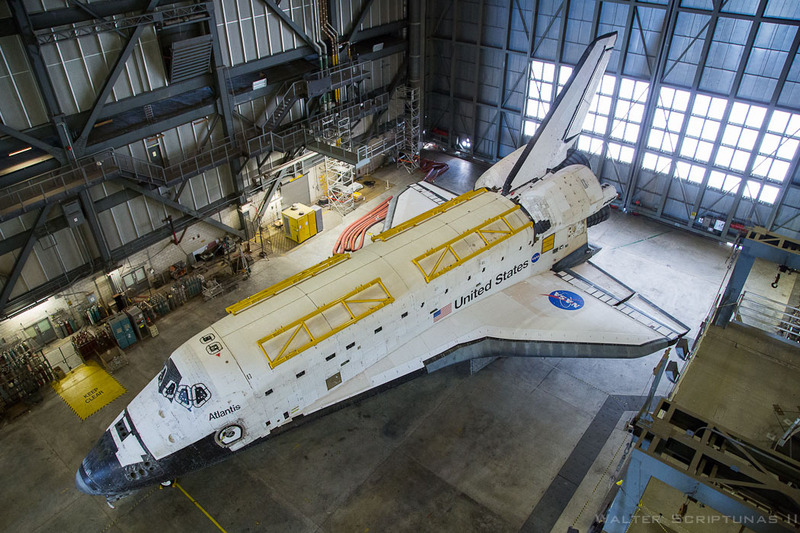 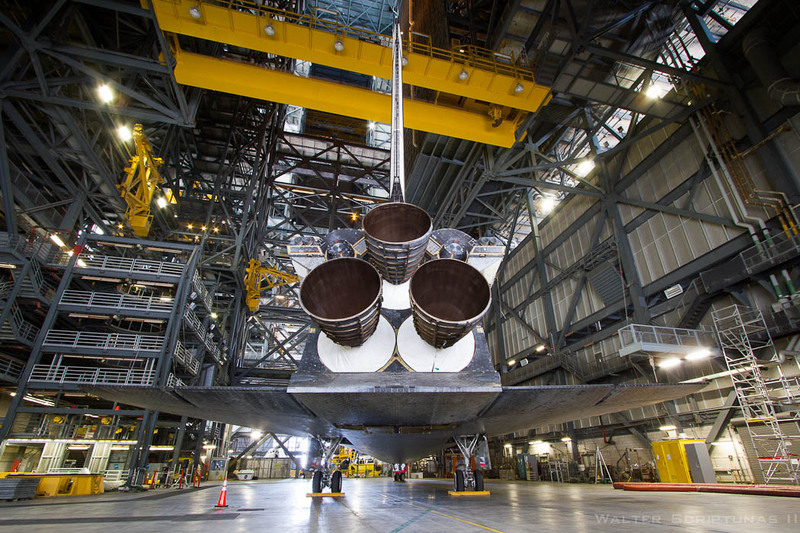 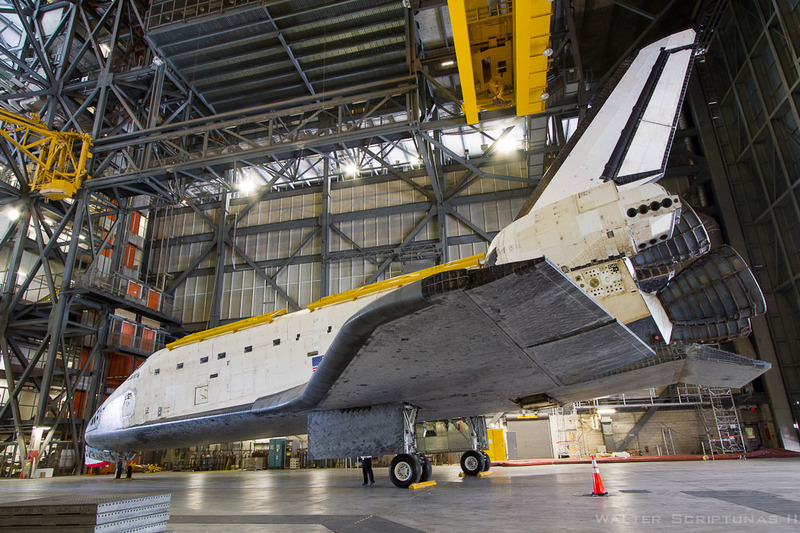 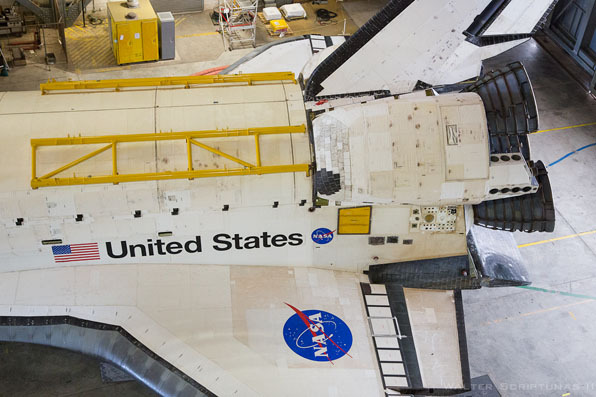 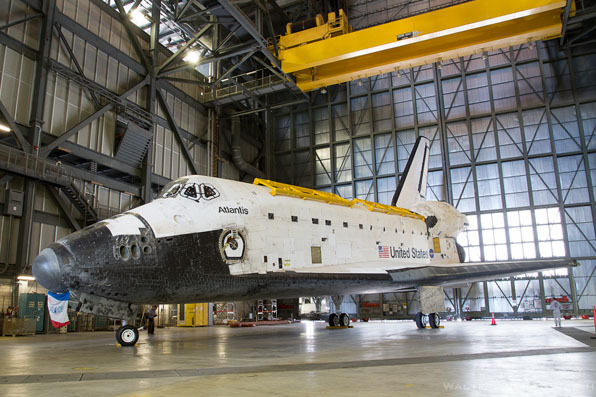 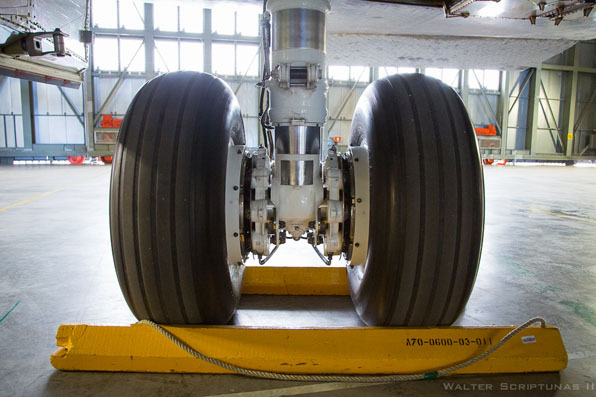 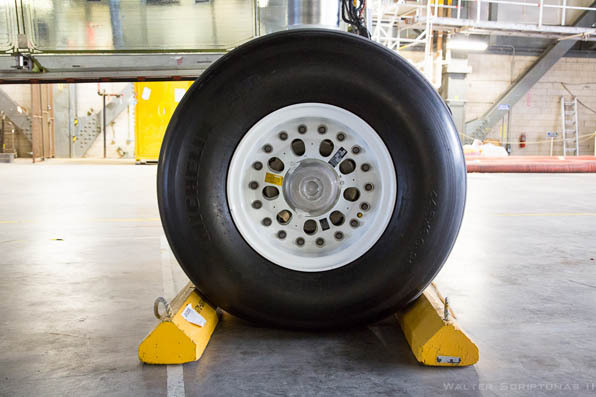 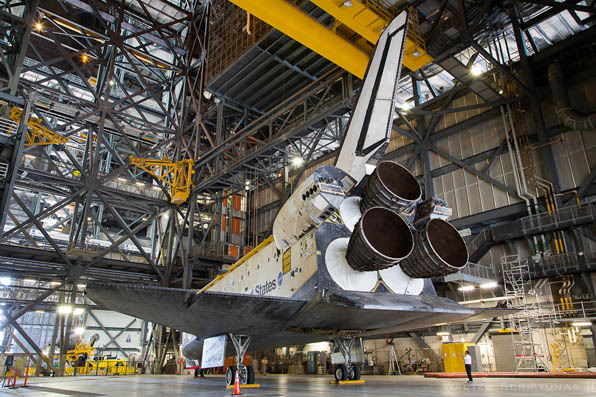 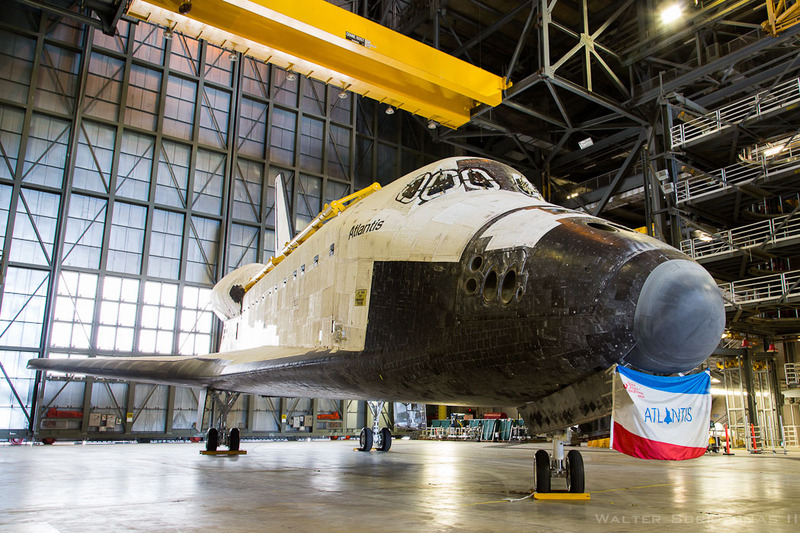 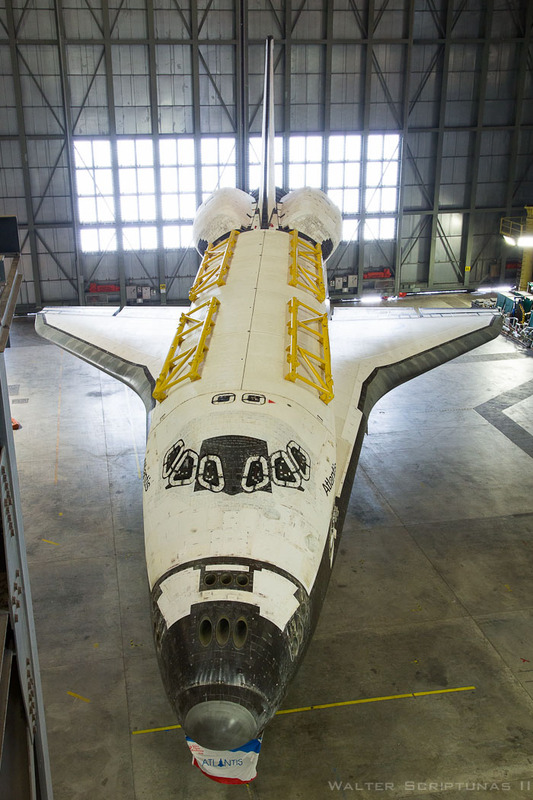 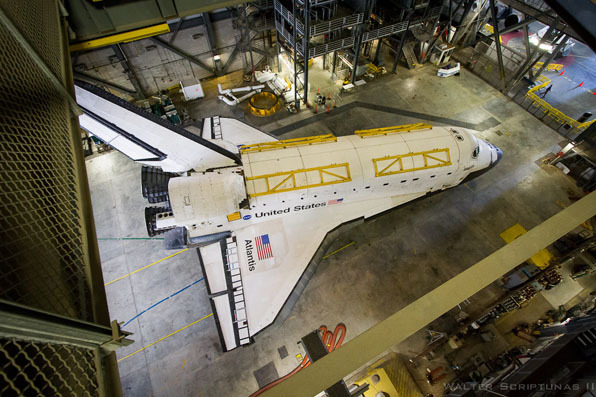 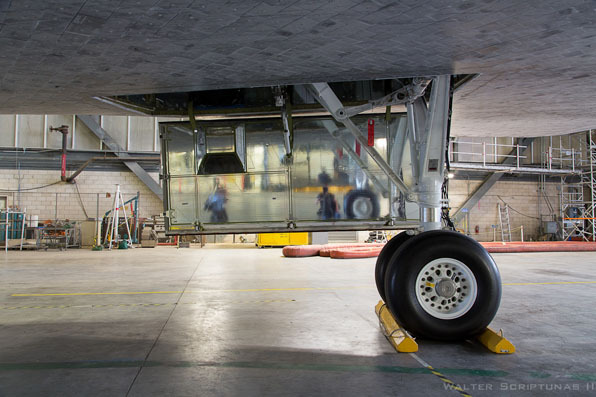 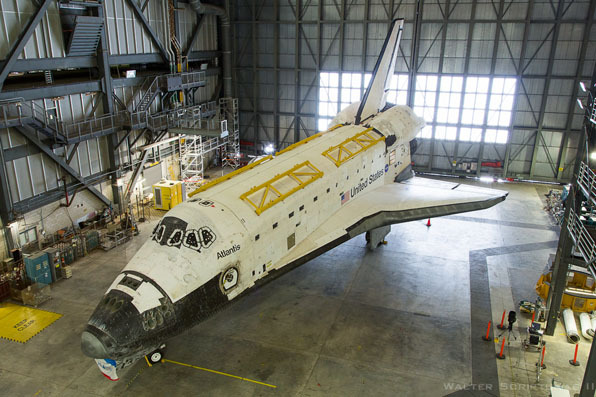 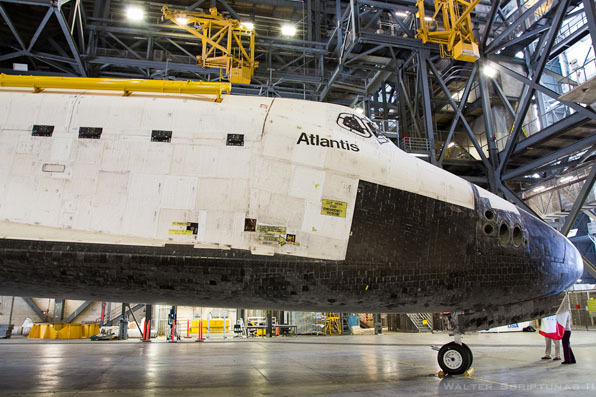 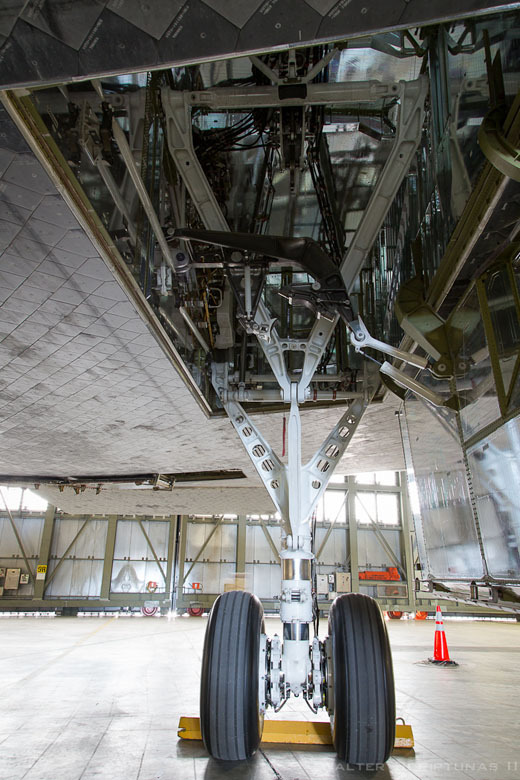 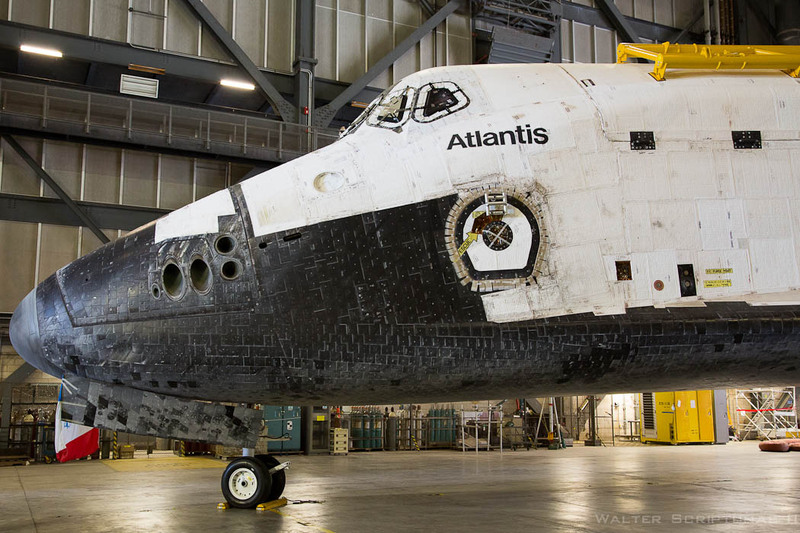 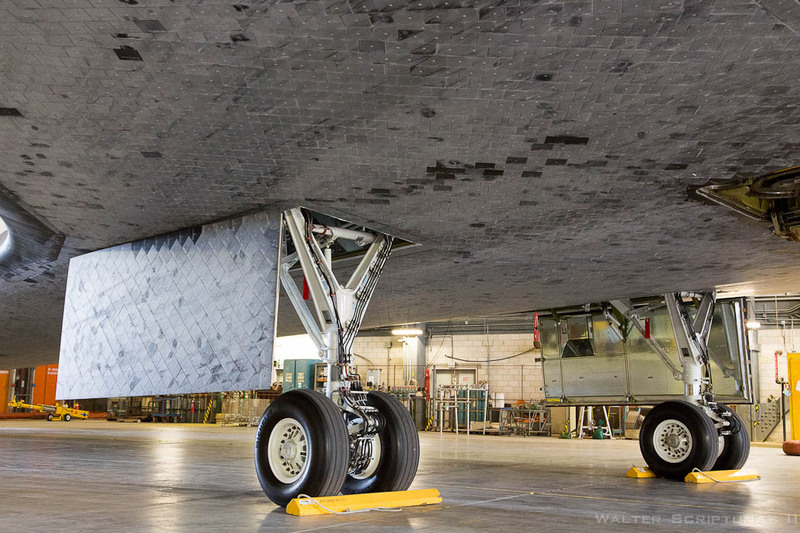 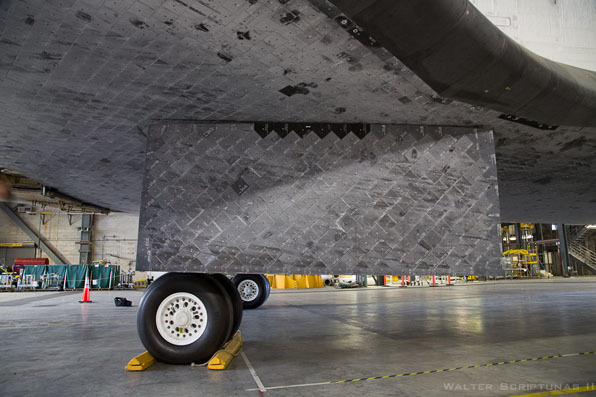 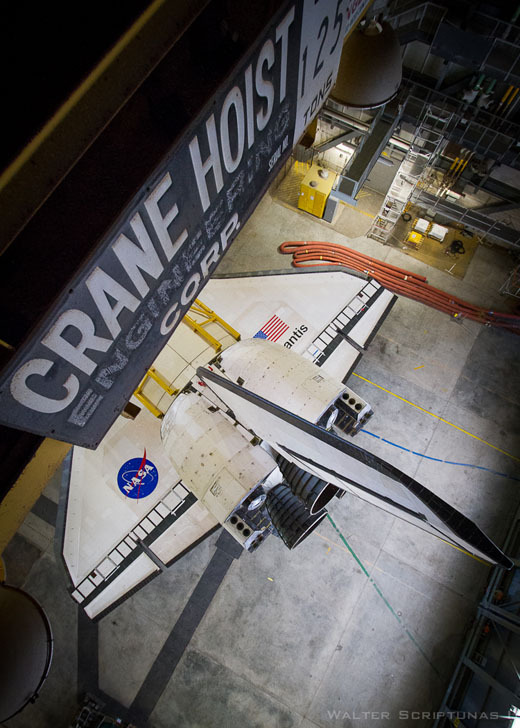 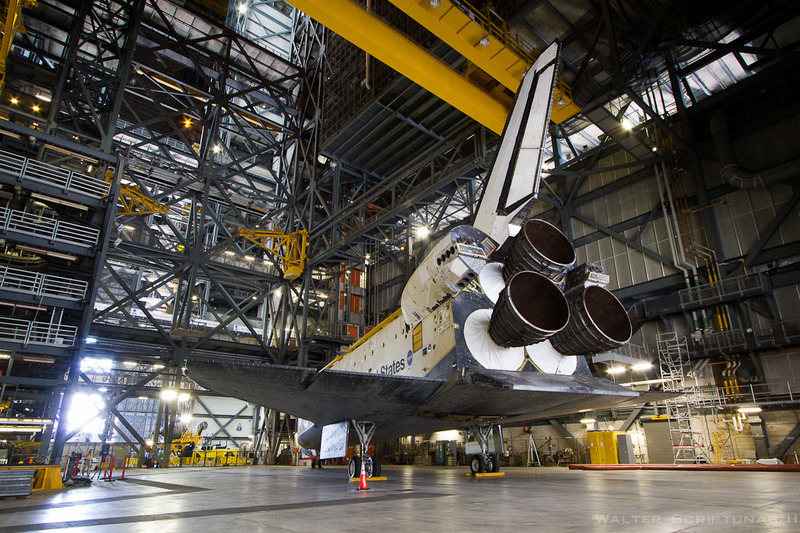 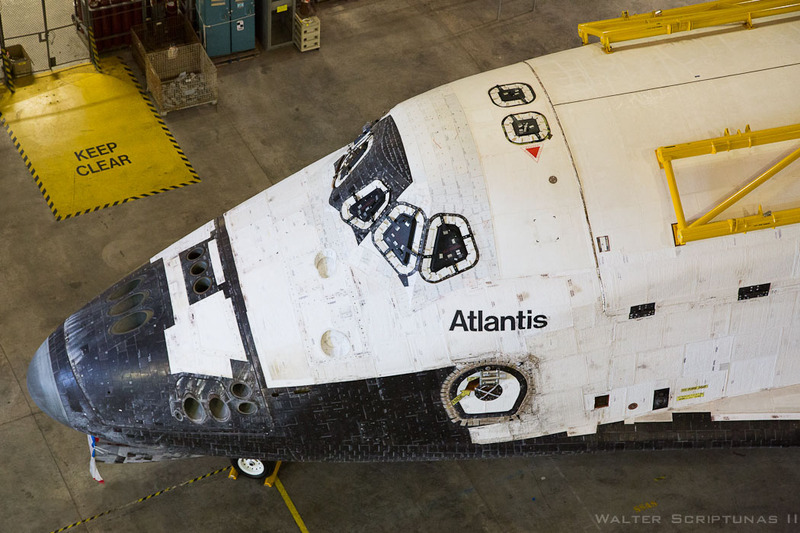 Atlantis is in temporary storage as NASA closes down its orbiter hangars one by one. 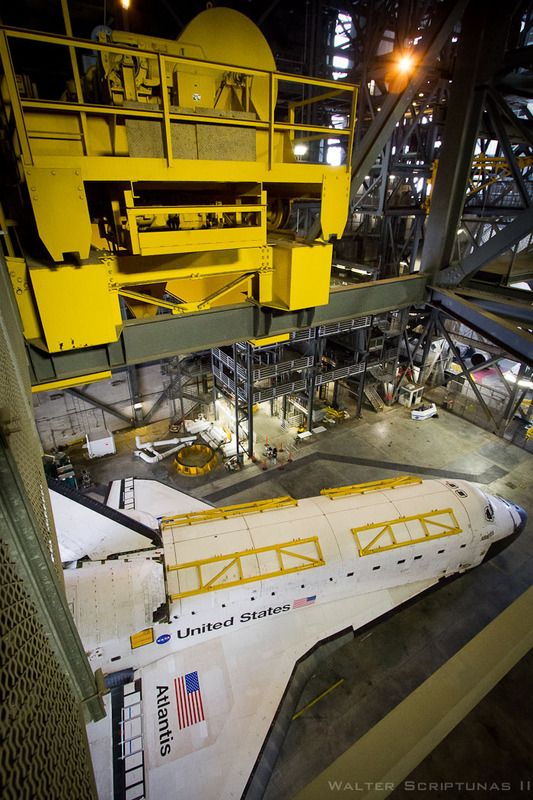 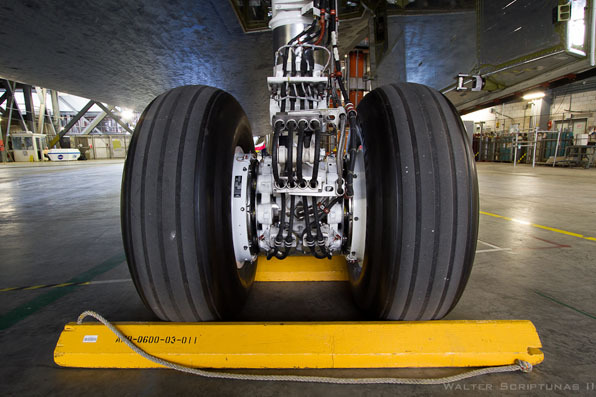 After Endeavour is finished undergoing her museum display preps in the sole remaining hangar next month, the two ships will swap places. 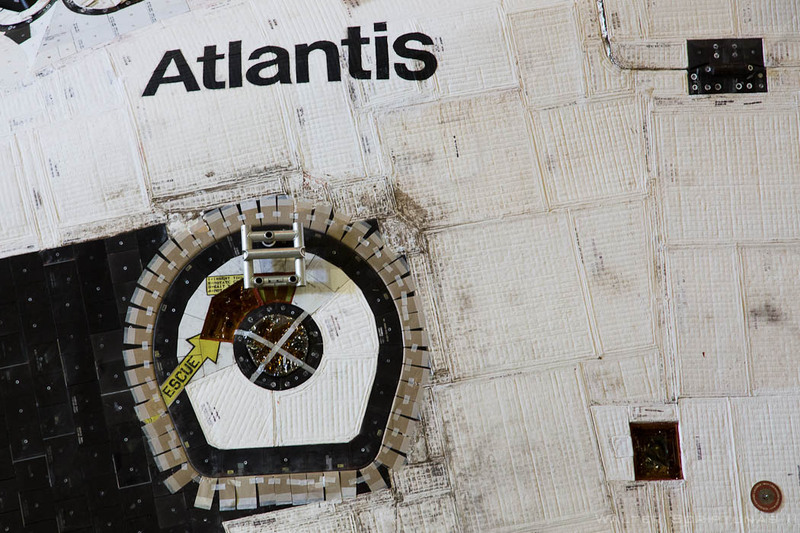 For now, tourists from the KSC Visitor Complex can go inside the VAB to see Atlantis. 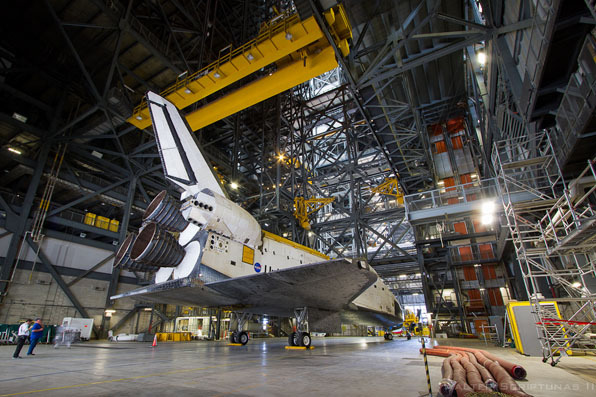 The bustling crowds break up the silence of the building with periodic bus stops, emitting "oooo's" and "ahhh's" as they get to see a spaceship for the first time. See our coverage from Atlantis' final mission.